Enterprise Resource Planning (ERP) system is an advanced system facilitating information sharing in varied departments of an organization. This off-the-shelf software enables an enterprise to operate more effectively and efficiently by integrating processes and data within the departments such as finance, marketing and human resources. So, what is ERP and what benefits does it have for businesses? Continue reading to find out the answers. ERP system is commercial software that allows consistent flow of information within an enterprise. This advanced software facilitates information sharing throughout the managerial divisions and geographical locations. With the help of this software, the decision makers can view and assess the required information and processes in a reliable, well-timed and consistent manner. With the advent of e-commerce, there has been observed a strong need to manage various sources of information and data within an enterprise. ERP software or system is simply the best way out for all such enterprises that have multiple sources of data and processes to manage. 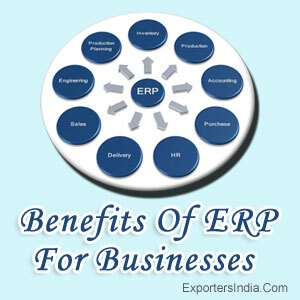 ERP provides a strong support to handle and utilize a comprehensive set of organizational information. The center of ERP software has a database that collects information from and provides information into the structural procedures that are performed on a common automating platform. Thus, the software regulates, and standardizes the varied organizational processes and data descriptions into a combined environment. With ERP software, enterprises are required to feed the data only once. This software provides uniformity and visibility all the way through the enterprise. Thus, it becomes quite easy to eliminate surplus data as well as rationalize the varied organizational processes that eventually lead to substantial cost savings. The integration achieved by ERP system among varied business functions allows consistent information sharing and communication, resulting in remarkable gains in speed and overall productivity. In a nutshell, the benefits of Enterprise Resource Planning (ERP) for businesses are many. And the fact that enterprises have started using this software for automating front office activities speaks volumes about its importance. Today, all the major and small front office activities including product configuration, sales and marketing, co-ordination with the clients, call center operations, security arrangements, lead-tracking etc. are efficiently managed with the use of ERP.